Can't have a picnic without pasta salad! 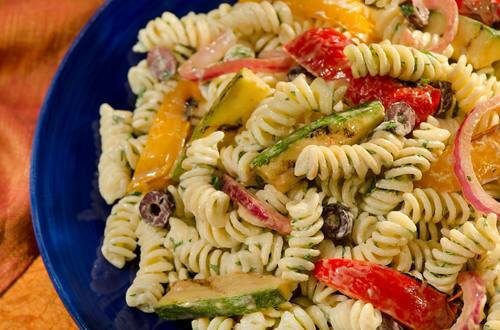 Our Pasta Salad with Vegetables recipe is addicting delicious and will have your guests asking for more. 1 Blend 1/4 cup Hellmann's® or Best Foods® Mayonnaise Dressing with Olive Oil, vinegar and ground black pepper in medium bowl. Stir in vegetables. Arrange vegetable mixture in grill pan or on foil on grill. Grill vegetables, stirring once, 20 minutes or until vegetables are crisp-tender. Cool. 2 Combine vegetables with remaining ingredients in large bowl. Serve immediately or cover and refrigerate until ready to serve.